Experience magnificent Arizona sunsets from the patio!.....CALL ME FOR A LINK TO MY VISUAL TOUR!!!! Fully furnished 3 bedroom 2 bath Santa Fe style patio home just moments from Sedona in the 55+ community of Verde Santa Fe Country Club, with fabulous mountain and golf course views. Includes privileges to the Agave Highlands Golf Resort, clubhouse, pool, spa, dining room, meeting rooms and exercise facilities. Enjoy area golf, hiking, biking, mountain biking, sightseeing, helicopter rides, ballooning, rafting, shopping, and dining, all just moments away from your front door. Spend the day at the Grand Canyon and return to relax and view outstanding sunsets from the expansive patio. The home itself is furnished throughout with an en vogue canyon style motif. The sumptuous master bedroom has a plush king sized bed, huge walk-in closet and a bay window overlooking the golf course. The other bedrooms are furnished with a queen sized bed and twin beds. From the expansive patio you can enjoy panoramic sunset views of the Mingus Mountains and the historical mining town of Jerome. Enjoy early morning walks on the golf course or relax and unwind at the end of the day on the patio. SEE THESE PHOTOS PLUS MORE IN MY VISUAL TOUR! It's only 11 minutes from the majestic red rocks of Sedona. You will be close to the amenities and small town charm of several communities. You can experience the Pink Jeep tours, sunrise ballooning, an abundance of hiking and biking trails, rafting, canyon train rides, dining and great shopping. For those brave enough, there is also sky diving just minutes away! The Grand Canyon is only a 2 hour drive. Winter skiing is only 40 minutes away. It is truly a magical place to visit! Welcome to PattiShack SW. After many years of vacationing with my cousin in this area, this fabulous home became available for purchase. Since I'm not ready to retire I've made it available to share with others. I've tried to make it as comfortable and inviting as anyone''s personal home and I think that you will ABSOLUTELY love your time here. I actually live in Indiana and count the days when I can spend my extra time here! PattiShack is soooo conveniently located. I tried Sedona, but the traffic and noise was just too hectic. My home is far enough removed for easy access to anyplace but far enough removed to enjoy the true peace and quiet of the wonderful area. Miles of National Forest Land and trails are right out your front door. The views from the back patio are unbelieveable. One of my favorite things is to sit and watch the sunsets. They are awesome. I'm totally in love with the little quail who skitter in and out under the rosemary bushes. 18 hole golf course. Enjoy a day of golf or critique the golfers as they go by! Spectacular sunset views of Mingus Mountains and the twinkling lights of the historic mining town of Jerhome. Cell phone reception is excellent from this location. No local landline installed. A very energy efficient home you'll be amazed at how cool the home is. But it does have central air and ceiling fans for further comfort. No need to bring tons of suitcases. Handy washer and dryer are here for your use. Full sized 2 car garage with garage door opener. Living room has ample seating with some spaces for extra guests. Great view of golf course. Refrigerator has door dispenser for water, crushed or cubed ice. The kitchen should have everything you can think of, includes a microwave. Even have a portable cooler for use for day long outings. There is a docking station/stereo located in kitchen for phones and Ipods. You'll be amazed at the size of the flagstone patio affording breathtaking views of the Mingus Mountains. Relax and enjoy the sunsets! Verde Santa Fe is a 55+ community. Call for more details on this feature. Heated pool for year round enjoyment for use by members and guests. Great place to stay. Well stocked, beautiful views. We golfed several times and thoroughly enjoyed our stay. Great headquarters to explore the red rock area. Copper museum in Clarkdale is a favorit. “Up the Creek” is a wonderful experience for dining and watching the hummingbirds. So happy you enjoyed it and some of my favorite places! Access to Grand Canyon- we took a Pink Jeep tour in a comfortable van. What better Christmas gift than to spend in Sedona area. The beautiful house was ideal for our needs. He had a great view and very quiet. We visited all of Sedona and the area. We will recommend to all to visit and stay at the house. Thank for the use of your house. Thank you so much for being my guests! I love to share my home with others and so happy you enjoyed your stay. Please come back! I highly recommend staying at this house! Patty was great to work with and the house was absolutely beautiful! The house was clean, the community was peaceful and it was only a few miles from downtown Sedona. From this location we were easily able to visit Sedona, Jerome, Prescott, Phoenix, Scottsdale, Flagstaff and the Grand Canyon! Being able to use the country club was an added bonus. The pool and workout areas were great! You will not be disappointed with this property!! This makes my second stay at Patty's Shack. We had an awesome time in this beautiful home right on the golf course. 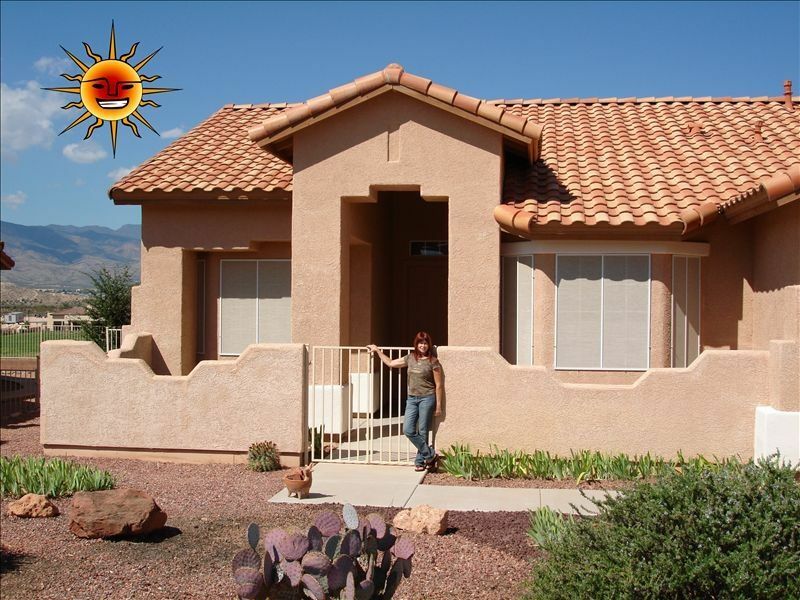 The home is decorated in the beautiful southwest style with very comfortable furnishings. The location is perfect being close to Sedona but out of the traffic rat race and great for watching the lights of Jerome come on in the distance. Visited Cottonwood, Jerome, Prescott, drove many of the back roads, took a hot air balloon trip, pink Jeep trip up Schnebly Hill (ask for the "Crazy Asian" Laura for your tour guide....you won't be disappointed). SO happy we chose this home. Beautifully & comfortably decorated. Great area. Love the amenities. Patty is excellent to rent from. Great communicator, quick to respond to questions. Her spacious home is very inviting & a pleasure to stay in. You feel like you're "at home". You have the security of being in a Community but it's private & quiet. The front & back patios make it possible to enjoy the outside throughout the day. We love seeing the roadrunners, quail, chickadees, wrens, bunnies & at night the desert hawks. I really like a good Jacuzzi spa & the one at the Clubhouse is excellent. We also enjoyed the pool, exercise room & pool table. You're close to Sedona (without being right in the busy traffic), hiking, sightseeing, history, adventure, shopping, restaurants . . anything you want to experience. Thank you Patty for sharing your home with us. We really enjoyed our time here. Most convenient location to all AZ tourist attractions without travel hassle. Only 1.5 hours to Grand Canyon. Area hiking and biking just out your back door. Must visit Historic Jerome and gallery shopping in Sedona. Hot air balloon over the valley. Ride the train into Verde Valley and see Eagles soar.